ERIKS has at its disposal of more than 6000 moulds for all kinds of rubber profiles or rubber extrusions made of industrial or higher grades of rubber. The material offering varies from NR, SBR to silicone and high-grade FKM materials or for instance Aflas®. ERIKS has the possibility to produce as well smaller as bigger quantities (lengths) in different production methods with salt bath, microwave, steam autoclave or Infrared curing. Not only rubber but also thousands of profiles in any required colour in the recyclable material family TPE are available in smaller or bigger lengths quantities. The decades of experience with rubber mouldings and extruded profiles enables the people of ERIKS to design and develop any specific rubber part, often in close cooperation with the customer. 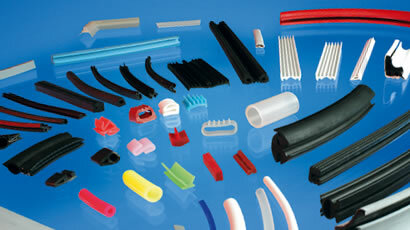 Rubber mouldings that help you solve any sealing problem in the world. The possibilities are endless. Where necessary, a rubber prototype sample can be made on short notice so that it can be tested in practice. After receiving the approval from the customer ERIKS offers the highest possible logistic serves whether that is for high volume or single piece requirements. In our own laboratories we develop any material required, whether that is on cleanness for Semicon applications or special material approvals and compliances for food or pharmaceutical industries, to name a few. ERIKS designs and develops innovative solutions for non-standard custom moulded rubber parts. Our in-house CAD/CAM and FEA analysis capabilities and quality systems guarantee an individual approach. With our optimized supply chains we offer fast delivery, competitive prices and engineering support. Besides this ERIKS offers a large assortment of more standard rubber products like grommets, bellows, plugs & caps and rubber balls.